Factory Sealed 2013 Topps Allen & Ginter Baseball Hobby Box mit 24 Packs a 8 Cards per Pack. Produktinformationen "2013 Topps Allen & Ginter Baseball Hobby Box MLB"
Yasiel Puig Autographed Rookie Cards!! Auch in der Serie - Axel Rose - Guns 'N' Roses Autogramm. Mini Parallel: Original-sized version of the base cards. Allen & Ginter Back: Featuring a new Allen & Ginter-logo back. Allen & Ginter No-Number: Limited to 50. Allen & Ginter Baseball Back: Featuring a specially created parallel back and hand-numbered to 25. Framed mini cards featuring on-card autographs from MLB superstars, both active and retired, and over 30 other athletes, champions, and personalities. 20 cards featuring authentic cut signatures of political and historical figures. Numbered 1 of 1. 100 cards featuring active and retired MLB stars, sequentially numbered and HOBBY ONLY. Artist's Originals: 30 actual, original, 1-of-1 paintings on a mini card and only found in Rip Cards. Allen & Ginter Red Autographs: On-card autographs from some of the autograph subjects, signed in red and hand-numbered in red to 10. Allen & Ginter Mini Exclusives: 50 cards numbered 351-400 and found only in Rip Cards, these are mini-card variations of players' base cards. Allen & Ginter Mini Wood Exclusives: A wood parallel of the mini exclusives. Numbered 1 of 1. Rip Card Reserve: 50 redemption cards for prizes, such as an autographed jersey or bat! New this year: DOUBLE RIP CARDS! One of a Kind: 50 literally one-of-a-kind cards, featuring firsts and unique items. There are no parallels or other versions of these cards - they are truly unique! Numbered 1/1. card, featuring more MLB superstars, both active and retired. No box will contain two of the same relic design. Allen & Ginter DNA Relics: 10 framed mini cards including a strand of hair from a historical figure. Numbered 1 of 1. Allen & Ginter Select Picks Relics: Framed relic cards featuring guitar picks used by famous guitarists. Numbered 1/1. Allen & Ginter Oddity Relics: Framed relic cards featuring odd and unique relic pieces. These hand-crafted cards will each feature a full, preserved spider in an exquisite window-box-style card. These cards will be inserted into packs as redemptions and numbered 1/1. HOBBY ONLY. 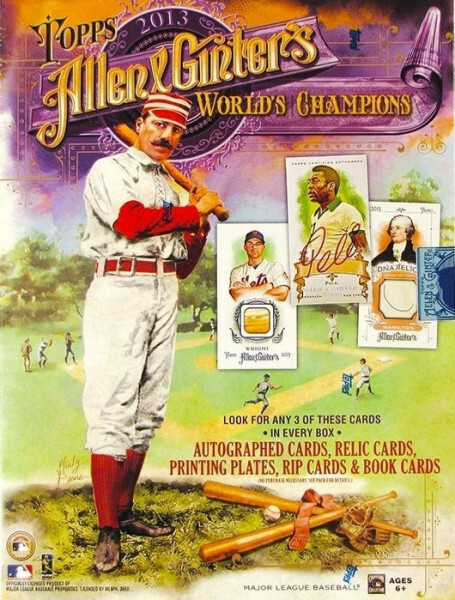 Allen & Ginter Book Cards: 25 book cards featuring players and two autographs, two relics, or an autograph and a relic. Numbered 1 of 1. HOBBY ONLY. Allen & Ginter Framed Originals: 100 framed original Allen & Ginter buybacks. Numbered 1 of 1. HOBBY ONLY. Across the Years: 100 cards connecting MLB stars with people who share their birthday. 1:2 packs. All other full-sized inserts are a combined 1:2 packs. One Little Corner: clear cards featuring planets, moons, and other interesting bodies in our solar system. Palaces and Strongholds: 20 cards featuring some of the largest and most impressive castles and forts in the world. Martial Mastery: 10 cards featuring the most fearsome warriors in history. Civilizations of Ages Past: 20 cards featuring civilizations that have come and gone. MINI INSERTS: Overall insertion rate for mini inserts is 1:5 packs. The First Americans: 15 cards celebrating various Native American tribes. Inquiring Minds: 21 cards recognizing some of the greatest philosophers to ever live. Heavy Hangs the Head...: 30 cards featuring monarchs from throughout history. Codes, Ciphers, and Cryptographs: 10 cards exposing famous codes. Peacemakers: 10 cards featuring famous peacemakers in history. Famous Finds: 10 cards unearthing famous archaeological finds. Box Loader Inserts: An all-new style for the box loader inserts. Box Loader Relics: Hand numbered to 25. Box Loader Autographs: Hand numbered to 15. Box Loader Autographed Relics: Hand numbered to 5. NEW! Box Loader Cut Signatures: Hand numbered 1/1. Wonders of the World Cabinet Box Loaders: Cabinet-sized cards featuring wonders from around the world. Cabinet Relics: 10 cabinet-card sized box loaders featuring relics you can't find anywhere else - full jersey pieces featuring player's names or numbers. Numbered 1 of 1. 10 more cabinet-card sized box loaders featuring relics you can't find anywhere else - full jersey pieces featuring player's names or numbers - and this time they're books, featuring two full relics! Numbered 1 of 1. Weiterführende Links zu "2013 Topps Allen & Ginter Baseball Hobby Box MLB"
Fanbewertungen für "2013 Topps Allen & Ginter Baseball Hobby Box MLB"